CSK finally managed to beat SRH and cement their place in the 2018 IPL final. If you missed this awesome match click here to read the match highlights. 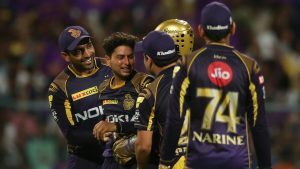 After that KKR faced RR in an eliminator to knock out Rajasthan of the IPL and booked their place in the qualifier match against Sunrisers Hyderabad. In case, you missed the eliminator match, click here to read the match highlights. Now it was time for KKR to face SRH in the second and final qualifier match of this IPL as whoever won this match would go to the final and the loser will be knocked out. So, basically it was a semi-final match between these two teams. The match wise highlights of the 1st and 2nd innings are appended down below. Batting: WP Saha 35 off 27 balls, Shikhar Dhawan 34 off 24 balls, Shakib Al Hasan 28 off 24 balls, Rashid Khan 34* off 10 balls. Bowling: Sunil Narine 1/24 in 4 overs, Shivam Mavi 1/33 in 4 overs, PP Chawla 1/22 in 3 overs, Kuldeep Yadav 2/29 in 4 overs. Target: 175 runs from 20 overs. Batting: Chris Lynn 48 off 31 balls, Sunil Narine 26 off 13 balls, Nitish Rana 22 off 16 balls, Shubham Gill 30 off 20 balls. Bowling: Rashid Khan 3/19 in 4 overs, Carlos Brathwaite 2/16 in 2 overs, Shakib Al Hasan 1/16 in 3 overs, S Kaul 2/32 in 4 overs. KKR had only one hurdle in their way to reach the final and it was a team that had the strongest bowling attack in this IPL i.e. the Sunrisers Hyderabad. On the other Sunrisers who topped the IPL points table this season were more than deserving and strong to beat KKR and reach the final. KKR had an advantage as the match was played on their home ground but the toss was still going to be vital. And, it was won by KKR as Dinesh Karthik chose to field first. The 1st innings went underway as SRH openers Shikhar Dhawan and WP Saha who was included in this XI started the innings for SRH. Both openers attacked the KKR bowlers from the very first ball as they shared a 50-run partnership between them in no time. 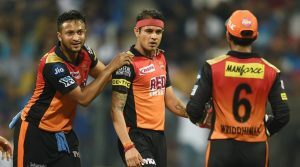 But, this partnership didn’t last for much long as Kuldeep struck in the 8th over as Dhawan edged out to Karthik and SRH lost their first wicket. Williamson now joined Saha but Kuldeep spun a web around him too as he fell to the spinner in the very same over and SRH were now 2 wickets down after such a solid start. WP Saha was now joined by the all-rounder Shakib al Hasan as both players looked to rebuild after Kuldeep’s double strike. However, after sharing only 24 runs to the scoreboard Saha also holed out as Chawla took his wicket. Deepak Hooda now joined Shakib as both batsmen steadied the innings for a while by sharing a 29-run partnership between them. However, the spinners were having a party as Shakib got run out by Kuldeep followed by Hooda whose wicket was taken by Narine in the 17th over and SRH had only scored 124 runs for the loss of 5 wickets. 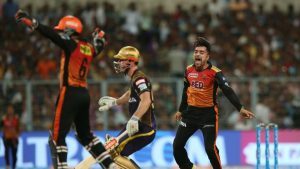 SRH now pinned their hopes on Carlos Braithwaite to finish the innings and get them to a respectable total but he failed to do so as he was run-out in the 18th over after managing only 8 runs. 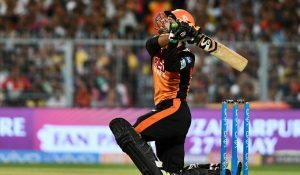 But, then came a surprise package in the form of Rashid Khan as his 10-ball cameo added 34 runs the total and SRH finished on 174 runs in 20 overs. KKR now needed 175 runs to win this match and book their spot in the final match against CSK. So, after the break KKR openers namely Chris Lynn and Sunil Narine got set on the crease and Bhuvneshwar Kumar was given the new ball. 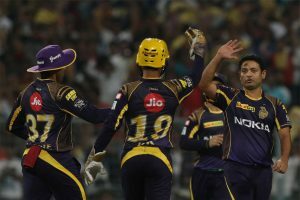 Both batsmen did what was expected of them they gave a blazing start to the chase by adding 40-runs in 3.2 overs after which Kaul took out Narine as KKR lost their first wicket of the match. Nitish Rana now joined Chris Lynn on the crease as both batsmen shared another partnership of 40+ runs after which Rana was run-out by Saha. Uthappa now joined Lynn on the crease however, the man in form Rashid Khan returned for his 2nd over to claim his wicket and KKR were now 3 down for 93 runs. Dinesh Karthik was the new man in but SRH had found their mojo as Shakib took out the KKR captain in the 12th over and the pressure came down on Lynn and the new man Andre Russell. But, SRH had no issue with any of them as their leading wicket-taker Rashid Khan took out Lynn in the 13th and Russell in the 15th to put SRH in the driving seat of the match. SRH did not stop after these wickets as they kept taking wickets as the lower-order crumbled in front of SRH’s superior bowling attack. However, Shubham Gill was the last batsman and he was still standing and scoring from the other end as he brought the equation to 19 runs in 6 balls. Brathwaite was given the last over and although his first ball went for a four, however his next two balls got him wickets as SRH won the match and cemented their place in the final. Rashid Khan was the man of the match for his excellent 10-ball 34 and 3 wickets in 4 overs. Only 1 match remains in the IPL 2018. And that is the final match between KKR and CSK. Here is the journey of all 8 teams in the points table as they qualified for the play-offs. For video IPL match highlights visit this link. Pakistan Vs England – 2nd Test: Five Deciding Factors?